Mt. Bachelor is just a short distance away from Sunriver and/or Bend, Oregon. For an exhilarating, uncontrolled ride down the mountain, jump on an inner tube and cruise down the slopes at Snowblast Tubing Park. Remember the days, when you put your arm through your inner tube and trudged up the snowy mountain slope, struggling to get to the top, so you could jump on board and take a short ride back down again to the bottom. Some of us were lucky, we had an older sibling or a parent who would take pity on us and help us haul our tubes back to the top. 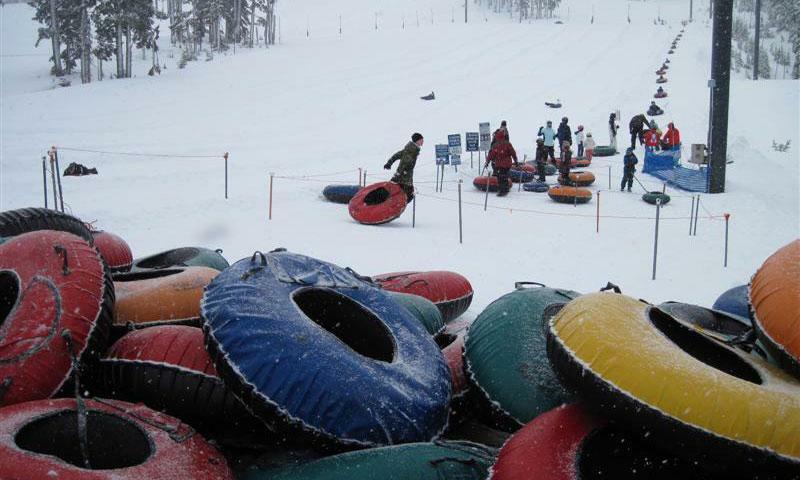 Snow tubing has been a favorite winter sport, even before skiing. Individuals were finding all types of apparatus to ride over the snow covered ground from the top to bottom of hills and mountains, letting gravity be the power source. Tubing is still great fun! At Mt. Bachelor, an entire section of the mountain is devoted to this wonderful snow activity. Take some time to enjoy Snowblast Tubing Park. Enjoy the long ride to the bottom, twirling, bumping your way over whoops and rollers to the bottom. And the best part, you and your tube can be towed back up to the top!